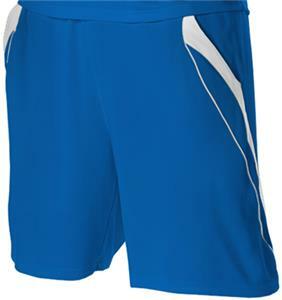 Alleson G506P1 Adult/Youth Gameday Tech Shorts. 100% eXtreme microfiber cationic colorfast polyester with moisture management fibers. 100% eXtreme mock mesh cationic colorfast polyester with moisture management fibers (light weight). Single ply body, cover hemmed leg openings. eXtreme mock mesh contrast color side piping and inserts. Self-color, eXtreme microfiber inserts between other inserts and piping. Top Selling Item. WAIST 19" - 20" 24" - 26" 28" - 30" 32" - 34"
Another great pair of athletic shorts at a great price. Bought as a gift.